I created this website in 2008 at the request of Stuart Wilde. He asked me to write the Tolemac Honor Code and take over teaching in 2007, six years before he passed, and we continued to work together providing lectures and workshops around the world, as well as other things. So, it took me a bit of time to actually get this website going, of which we eventually launched at the end of 2008. And Stuart insisted that we name this site thehoodedsage.com. He was adamant about that and wouldn’t change his mind, so I agreed. Since then, I’ve heard a number of strange assumptions, comments, and misconceptions about the Hooded Sage and the Hooded Sage Course. And I’ve even heard of people introducing themselves as members of the Hooded Sages or the Tolemac, of which I find a bit silly. The Hooded Sage Course is not a club. It’s not a cult. And it’s not a social site. There’s no official organization or name, although some people have met at events and become friends over the years, which is a natural human tendency. It’s normal. 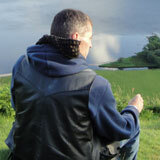 The Hooded Sage Course is an online school of philosophical disciplines, meditations, and techniques. It’s a course that a person can study from the comfort of their own home — through a computer screen. To avoid any further confusion, I would like to explain what “The Hooded Sage” is. The thing to understand about all of this is that the Hooded Sages are Ancient Mysteries and Inner Wisdoms that one can align to with their inner feelings. You have to understand that your higher self is like a cloak of energy that you can wrap yourself within. The Hooded Sages are Mystical Energies that one can align to. It’s both a philosophical discipline and an energy. The discipline and energy offer humanity the ability to transcend the collective emotion and mind of the world and enter into a state of spiritual transcendence. The journey takes one into the discovery of their own higher evolutionary path and purpose.